Karen, I never knew that! Perhaps my parents will recall, but I don’t think I remember. Thanks SO much for letting me know. How cool. Small world! That was so awesome. I never knew you grew up in a hospital. What a cool life. I’m so lucky to know you. You’re parents did a fabulous job raising ya’ll I’ve never known a more educated and compassionate family. Thanks, Dad. Yes, there were too many memories to mention, but I hit some of the high points. it was fun. It was never weird to us. Lots of laughter in those halls. And memories that will long remain even without the building. Thanks for that Cathey. That’s true, sis! It was unique, but not weird. We were used to it … living in a “housepital” felt normal to us! We had a blast. So enjoyed this peek back into my old hometown. 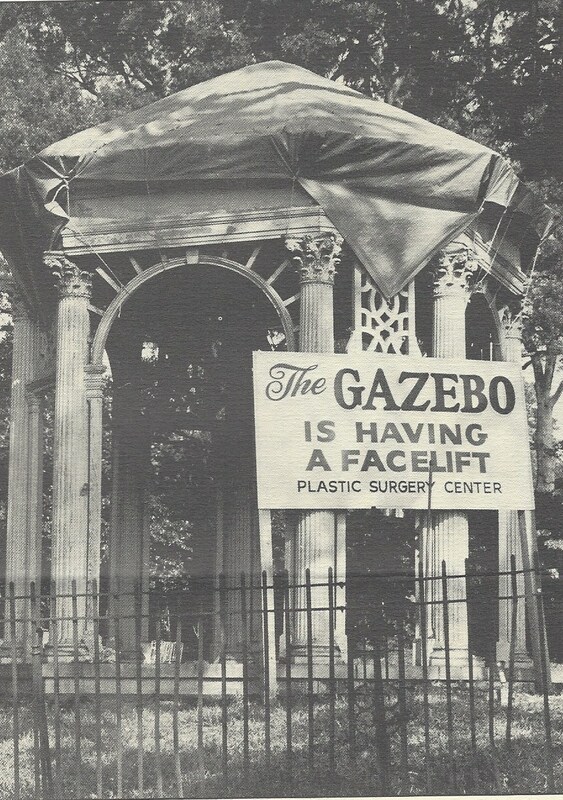 I remember that gazebo well. I also remember your father and mother, who were wonderful friends to us & our ministry. I recall your dad performing an impromptu surgery there for me one afternoon, and I remember your mom “analyzing” my colors from her special cosmetic counter in the hospital. And I’ll never forget the blessing you were to our ministry as you held down the fort for us as we traveled abroad. Love you all! Tonya, you are so right that we share a woven past! Such fun memories. I loved paying the bills for you and Mike! Love you guys, too. Thanks for the kind words! When I little I had no clue it was also a home, but had a feeling it was a hospital. 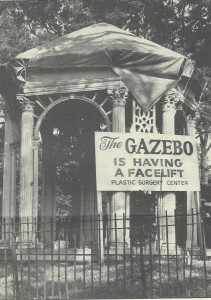 The one thing that kept grabbing my attention besides the building was the gazebo out back, and stare at it each passing day. It took some to tell me what home was used for, and very cool of you to fill in the blanks about that awesome place.